Join Yarmouth Recreation and YASHA (Yarmouth & Acadian Shores Hiking Adventures) for a free guided family hike! 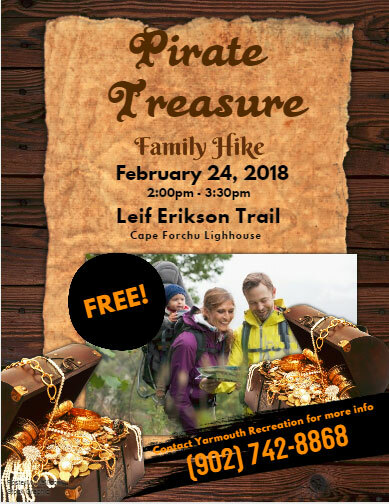 We will start at 2pm at the Leif Erikson Trail at the Cape Forchu Light Station. Help us dust off the old treasure map we found and figure out where the treasure may be hidden while enjoying one of the most scenic walking/ hiking trails we have in our region. Let us know you’re coming by registering here or on our Facebook event posting. It’s a family hike so any age you have in your family. 🙂 Parents and Guardians must be present. The trail at the Lighthouse is stroller friendly as long as we do not have an amount of snow.